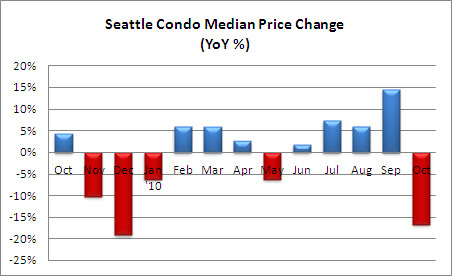 Not too surprisingly, Seattle’s median condo price dropped last month to $250,000, a 16.67% year-over-year decline and a 15.3% dip from September. There was a bump in last October’s median price brought about by a rash of sales in order to meet the November tax credit deadline. 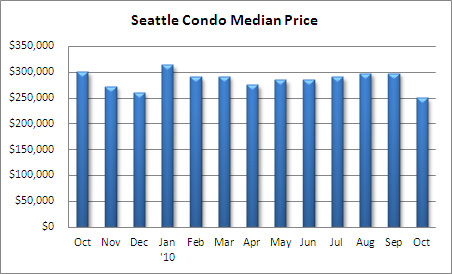 That, combined with lingering buyer apprehension, resulted in a poor condo market performance last month. The number of Pending and Closed Sales transactions took another hit in October. Compared to the same period last year, Pendings and Closed Sales they were down 50.4% and 32.6%, respectively. Again, a factor was the November 2009 tax credit deadline, though uncertainty about the economy contributed to buyers weariness. The number of active condo listings declined to 1,349 units in October, a 5.7% decline from September and just 0.9% more than last October. The reduction is mostly attributable to the cyclical end of the year slowdown. 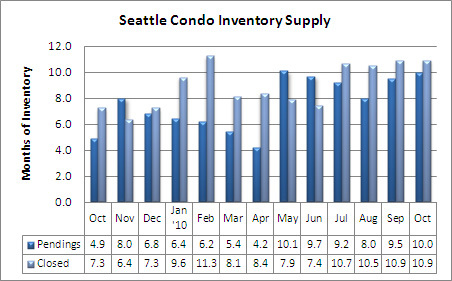 Although, active listings reduced, the citywide Seattle condo inventory supply remained high with a 10-month supply rate. That is, if no new listings come on the market, it will take 10 months to exhaust the supply at the current sales velocity. This represents a firm buyers market environment, overall. Though, market conditions will vary by neighborhood (location) and price point. When factoring in unlisted developer units (e.g. Olive 8, Escala, Enso) and shadow inventory, the true supply rate is much higher…more than 14-months. It’ll be a long winter for the Seattle condo market, which will have a way to go before turning around. Not pleasant news for condo owners and sellers, but it could be an opportunity for qualified buyers given the abundant inventory, volatile prices and continued low-interest rates. Condos aren’t for everyone so be sure to discuss the benefits, disadvantages and risks of condo-ownership with your agent. 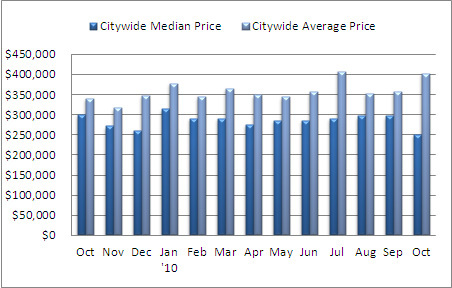 I added a new graph per readers suggestion, comparing the median and average citywide sold prices, though average is not a great metric; a single transaction such as the $5.9 million sale at Escala in July and the $7.2 million sale at the Four Seasons in October skewed the average sales price. Excluding the $7.2 million sale in October reduces the average sales price from from $403,182 to $347,939. Condo sales have been relatively consistent with 60-64% of sales priced under $350,000. Wow, I didn’t realize the Seattle market had taken such a big hit. What percentage of October’s closed transactions were distressed properties? @Alex – 22 closed units were either short sales or REOs in October…17.8%. Of the current actives, short sales and REOs make up 21.1% of the total units for sale. Looks like things are a bit tough, but there is opportunity in every market. With the excess inventory, are you seeing a lot of foreign buyers coming in and taking advantage of the market? @Brent – we’ve fielded several calls from Chinese cash investors…I know other brokers have as well. Our market is becoming increasingly attractive to foreign investors. What is a good long-term healthy inventory target? You say 10 months is high…can you tell me what it is when the market is hot or even when its generally medium healthy? Thanks for the updates! @Zach – Generally speaking under 3-months of supply equates to a strong sellers market, where homes are selling faster, often at or above list prices. A “normal” housing market is when there’s between 4 to 6-months of supply. Above 6-months is considered a buyers market. 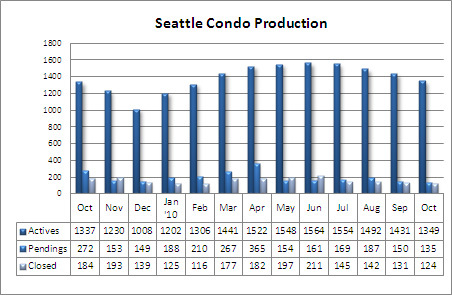 Seattle’s condo market has one thing going for it, there’s been no new condo construction starts since 2008 and none are expected to start for at least two years, minimally. Though, condo-to-apartment conversions could convert back to condos (e.g. Rollin Street, Equinox, Domaine, etc). Those are some scary numbers. Hopefully the affordability will improve enough by spring to jumpstart your condo market. 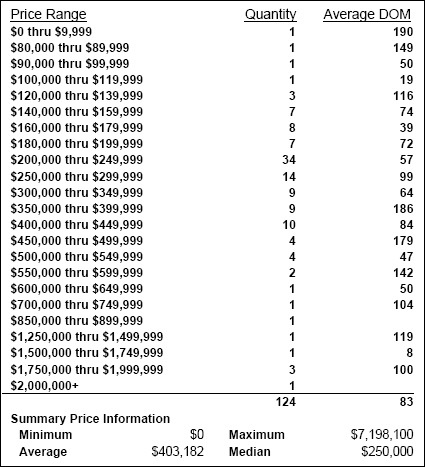 In Portland, we have had two major auctions of 50+ condos at a time in two buildings (at the south waterfront) that were finished about the time time the crash started. These auctions caused big drops in sales prices for the affected condos, but not so much for other neighborhoods. Other condos that were scheduled to be released ended up being apartments. Same thing up there?